Germany's two main political parties have reached a power-sharing agreement — but voters will need to give it their seal of approval first. It's been over four months since its latest elections, and Germany finally has a government again. Almost. Chancellor Angela Merkel's center-right Christian Democrats have reached a power-sharing agreement with their center-left rivals, the Social Democratic Party, or SPD. The coalition deal unites the two largest factions in Germany's parliament into one governing majority. Merkel has relied on exactly this coalition for two of her three four-year terms. But the Social Democrats have been hesitant to sign up for a third round as Merkel's junior partners — partly over fears the party was moving too far to the right. Plus, with both major parties in government, the opposition role would fall to the upstart Alternative for Germany party, or AfD. The far-right party campaigned on an anti-immigration, anti-Muslim message during the election — and clinched its role as the third-largest party in parliament by winning 94 seats. The Christian Democrats ended up getting their coalition again, but they had to make some pretty big concessions. The Social Democrats are winning control of the all-important finance ministry, which could let them dramatically shift Germany's eurozone policy. They'll also run the foreign and labor departments; current SPD leader Martin Schulz is expected to step down from his role and helm the foreign office. 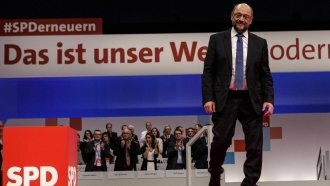 In exchange, the SPD moderated some of their positions on health care and immigration, and gave the Economy Ministry to the Christian Democrats. And the Christian Social Union, the Bavarian sister party to the Christian Democrats, is taking charge of the country's Interior Ministry. But before any of these changes can go into effect, the Social Democrat voters have to sign off on the coalition deal via a postal vote. The results from that are due in early March, and that vote is currently looking too close to call either way.